My short interview with Toronto poet Andy Weaver on his forthcoming third poetry collection, this (Chaudiere Books, 2015), is now online at Queen Mob's Teahouse. We're more than two years and nearly seventy posted essays into the occasional series of "On Writing" essays I've been curating over at the ottawa poetry newsletter blog. I've included an updated list, below, of those pieces posted so far, and the list is becoming quite substantive. Way (way) back in April, 2012, I discovered (thanks to Sarah Mangold) the website for the NPM Daily, and absolutely loved the short essays presented on a variety of subjects surrounding the nebulous idea of “on writing.” I would highly recommend you wander through the NPM Daily site to see the pieces posted there. Forthcoming: new essays by Jennifer Kronovet, Natalie Simpson, Susannah M. Smith, Rebecca Rosenblum, Renee Rodin, Pam Brown and Sheryda Warrener. 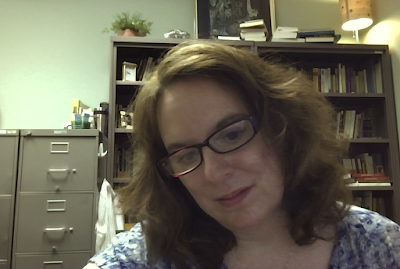 Suzette Bishop teaches at Texas A&M International University in Laredo, Texas. She has published three books of poetry, Horse-Minded and She Took Off Her Wings and Shoes, and a chapbook, Cold Knife Surgery. Her third book, Hive-Mind, was released January 2015. Her poems have appeared in many journals and in the anthologies Imagination & Place: An Anthology, The Virago Book of Birth Poetry, and American Ghost: Poets on Life afterIndustry. A poem from her first book won the Spoon River Poetry Review Editors’ Prize Contest. In addition to teaching, she has given workshops for gifted children, senior citizens, writers on the US-Mexico border, at-risk youth, and for an afterschool arts program serving a rural Hispanic community. My chapbook, Cold Knife Surgery, was edited with a loving hand by Laura Qa, the editor of Red Dragon Press. That was a life-changing experience, having another writer and editor believe in my work that much, an astonishing faith in my work after four long years of rejection. She also asked me to write a Forward about the long poem comprising the manuscript. As the poem was about surviving cervical cancer and the kinds of invasive procedures used in the early 1990's to diagnose and treat it, summarizing what I was trying to do and say became a final step of healing, for me. The exercise relegated cervical cancer to the past instead of something I kept re-living. I continue to want the free verse lyric poem and the experimental long prose poem in my life and go back and forth between the two, seeing how one might inform the other. My most recent book, Hive-Mind, starts with lyric poems and then shifts to collaged prose poems and then to phrases scattered across the page, while Cold Knife Surgery is all one long collage prose poem. The chapbook has lyric moments, I think, but doesn’t include both types of forms the way my recent book does. The narrative of Cold Knife Surgery is disrupted but basically follows a straight line from my cancer diagnosis to post-surgery. Hive-Mind, on the other hand, attempts to tell the story of Colony Collapse Disorder and of beekeepers with my life at times intersecting. The narrative is more recursive and also is about a shifting of shapes: hive-like centered poems, bees gathered on a screen in a hive box, swarming. Actually, I started with fiction. I had very little exposure to reading or writing poetry until my senior year in high school, and, honestly, little interest in it! I wasn’t able to enroll in my college intro creative writing class my freshman year because it was too full, but a poet, Stuart Friebert, agreed to a poetry independent study for my Winter Term project based on the poems I had written in high school. He prescribed “shock therapy” as he called it, giving me a long list of mostly contemporary female poets to look up and read in the snowbound library. He also required me to write three poems a week. Stuart usually felt one poem was strong, much to my surprise, a second poem weak but had potential with a lot of work, and a third poem needed to “go in the attic” as he would put it. Once I took the intro creative writing class my sophomore year, I found myself falling in love with poetry and filling up the five-page weekly requirement with poems more than with stories as the course progressed. Something cliqued for me about the way I’ve always thought metaphorically and through images. It varies. A short lyric poem draft happens quickly, but how long it will take me to revise it and tinker with it is anyone’s guess, from a few hours to years. The idea for a collage poem may occur to me suddenly, but executing the idea is a slower piecing kind of work, like quilting. Yes, I will take notes on subjects requiring research, such as bees and beekeeping, and some poems or parts of them will result from the notetaking. It was difficult to get started on new poems right after my first book publication because it became clear I needed to shift to thinking more about working on a book from the very beginning. The first book came together in an organic way after creating a body of work and selecting poems from that body of work that fit together. But a second poetry book, I realized, involved more planning up front and stifling of the voice that questioned whether I could produce another book as good as, if not better, than the first book. Listening to music helped a lot to stifle that voice. Having an idea, as vague as it might be, about a subject matter for a book and calling it a “project” also helps with the way I work around the academic calendar and with the critical voice in my head. I will end up with poems that don’t fit with the project, too, and those I’ll submit separately to literary magazines or allow to sit to see if they may develop into a different book project. Well, I’m an introvert. I’m also an introvert who works as a professor which forced me to get more comfortable with public speaking. It’s a double-edged sword, however, as I can use up my limited energy for social interaction by the end of a work week and need the weekend, when readings are usually scheduled, to recharge. Rather than simply “shyness,” introversion is also about the way social interaction takes more energy for introverts than for extroverts and the way introverts can experience sensory overload in social environments. Add Chronic Fatigue Syndrome/Fibromyalgia to the mix, and I find I have to be ruthless about pacing my social interactions and getting in enough quiet and solitude to recharge. I’ve struggled, too, with how to translate the visual qualities of my work in a reading forum. How my poems look on the page is important to me. I worked up a pdf of my poems for my second book and have done the same for Hive-Mind. It was great to finally feel that an essential part of my work wasn’t be lost during readings. I have no idea if the questions are answered in my work or how relevant those questions may be for other writers, but I ask myself two questions: what happens when I approach poetics and form with both/and thinking instead of either/or thinking, and what can I make use of to piece together like squares of cloth for a quilt. I’m guessing the second question may come from a background that includes poverty and near-homelessness as I had to become good at making due with what I had. For poetry, the “pieces” I use are my experiences, the approaches and techniques I was taught by my teachers, what I read, other texts. The first question may in part come from an association of either/or thinking with schools of poetry in the past that didn’t include women or relegated them to a position of being seen but not heard. Poetry’s readership is very limited, and if print runs are any indication, typically 1,000 copies when my first book came out in 2003, 100 print-on-demand copies today, the readership is shrinking. Even when it was 1,000 copies, nearly half were bought by university libraries and may have never been checked out. Despite that grim reality, I continue to write and hope my work will affect at least a few people. Validating others’ creativity, whether it’s been in the classroom or through nonprofit organizations, has been a helpful service, I hope. It’s a part of who we are that gets denounced or devalued, and I feel priviledged to be in a position to have constructed some safe zones for creative expression. I’ve been very grateful to my book editors. 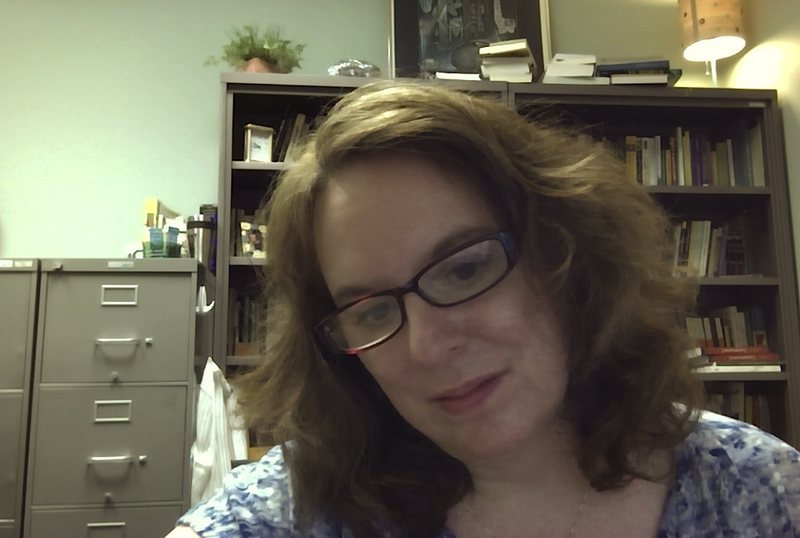 My current editor at Stockport Flats Poetry, Lori Anderson Moseman, like Laura Qa, devoted a tremendous amount of her time editing and designing my manuscript. I think the book is much the better for it. And she kept me on task and provided encouragement and cheering when I needed it. Persistence. I wrote my first poem my senior year in high school but didn’t get a poem published in a literary magazine (other than my college literary magazine) until ten years later. I submitted my chapbook to zillions of presses for four long years until a small press accepted it. My second book involved another four years of submitting before accepted, the current one, three years. There were a lot of rejection letters during those years, and rejection letters will continue to be in my life. Keep submitting. 10 - What kind of writing routine do you tend to keep, or do you even have one? How does a typical day (for you) begin? I think, now, more about a writing routine over a year's trajectory than a daily one. I teach at Texas A&M International University, a fairly new university of primarily first-generation students with a newly implemented creative writing minor I helped to develop. In other words, there’s labor-intensive building from the ground up to do. Teaching has priority for me over writing once the semester is underway. I don't seem to be wired to limit how much time and energy I put into lesson plans, grading, or responding to students' or programmatic needs. It just doesn't seem right to do that. So, it becomes a 7-day work week once the semester is underway. I steal time to do low-stakes writing, such as writing in my journal, doing freewriting while a class is doing an in-class writing exercise, or doing reading and researching. Happily, I end up tricking myself into producing more rough drafts of poems than I think I will or than I ever did when trying (unsuccessfully) to keep to a daily routine. 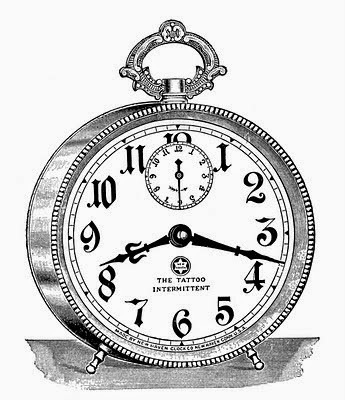 The holiday break and summer are when I do the more intensive, high-stakes writing and revising, avoiding a clock as much as possible. My day will begin very differently depending on what time of the week or year it is. During the school year on a school day? It starts by rushing to get ready for work and out the door. During the summer, I'll head straight to the computer to answer emails, work on poems, and then fix some breakfast when I'm ready for a break. 11 - When your writing gets stalled, where do you turn or return for (for lack of a better word) inspiration? To my experiences, observations, dreams, reading, day-dreaming. 12 - What fragrance reminds you of home? When I open a book to the title page, that smell. 13 - David W. McFadden once said that books come from books, but are there any other forms that influence your work, whether nature, music, science or visual art? My current book, Hive-Mind, is about bees while my previous book, Horse-Minded, also included poems about environmental concerns and disease. Cold-Knife Surgery was informed by what I was reading about the scientific research of cervical cancer. My first book, She Took Off Her Wings and Shoes, included a section of poems based on female visual artists, with some additional poems on that included in Horse-Minded. Although not declared, I had enough college credits for an art history minor and had taken some art courses and worked in the college museum. I’m also married to an art historian. I have very fond memories of the classical music environment at Oberlin because of the conservatory. One of my roommates was very musical, another was a celloist, I dated an oboist, and there were always free concerts and recitals. 14 - What other writers or writings are important for your work, or simply your life outside of your work? Memoirs and biographies seem to be what I’ve been craving lately for my life outside of work. Those of other female writers and artists, of course, but more recently, memoirs by survivors of dysfunctional and poverty-striken families like my own: Let the Tornado Come by Rita Zoey Chin and The Glass Castle by Jeannette Walls. 15 - What would you like to do that you haven't yet done? Combine my love of therapeutic horseback riding which I do for CFS/FM with therapeutic writing for a community in need. 16 - If you could pick any other occupation to attempt, what would it be? Or, alternately, what do you think you would have ended up doing had you not been a writer? Many years and pounds ago, I was returning to college, taking a bus from New York City back to Oberlin, Ohio. A gentleman sat down next to me after looking me up and down. My first thought was that this was going to be a really long trip. His first words changed my first impression as he asked me if I had ever thought about exercising racehorses. He turned out to be a racehorse trainer, and he gave me his card to contact him. I sometimes wonder what it would have been like if I had contacted him. Anyway, it was a very congenial bus ride and the time flew by. 17 - What made you write, as opposed to doing something else? Poetry records what it’s like to be alive, to be human. I love the way a poem can slow down or stop a moment and describe all the internal and external facets of that moment. Given our rushed lives, poetry allows us to slow down and look at something closely and to even see what someone else sees and experiences. I love the chance to reach someone else and move another person, make someone laugh or see things in a new way or articulate something someone may have always known or felt. I like the challenge of working with language in a new and surprising way, especially visually on the page, getting the reader to even pause for a moment to look at the poem's shape and "see" the images I've created. Given our overly hectic days, I think we need those moments of contemplation more than ever. And writing poetry provides a rare opportunity to be completely honest. 18 - What was the last great book you read? What was the last great film? Emily Dickinson: The Gorgeous Nothings edited by Marta Werner and Jen Bervin, compiling Dickinson’s envelope writings. I watched Sense and Sensibility again last week. 19 - What are you currently working on? I’m working on a series of poems about an endangered species. I have fifteen poems so far, and I’m not sure if it will be a chapbook or a book or a section of a book. We’ll see!